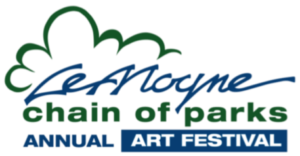 The LeMoyne Chain of Parks Art Festival Committee is pleased to offer three scholarships to area Emerging Artists for participation as exhibiting artists! Three select student artists will have the opportunity to sell their work, meet other artists, and participate in a nationally recognized festival with all fees being waived by the Festival Committee. The emerging artist program is designed to encourage students just beginning in their careers to participate in the world of outdoor festivals. Through this opportunity, these Emerging Artists experience the application process, selection and venue logistics of exhibiting at art festivals. To qualify as an Emerging Artist, you must be a currently enrolled student in an area university or college. Prior to final invitation, the Festival Committee will validate current student status.